Maxwell, I think that you are on to something there! Oohhh... I LOVE that idea! I'm sure I can convince the peep to keep the treats comin'. And our tree is STILL up. Now to work on those gifts. A nip mouse every day! PURRS. Maybe Maxie means treats and gifts for the hoomans? All five of us are on board with this idea, 3 hounds and 2 cats. How do we get it started? That sounds PAWSOME!!! How do we make it happen?!?!?! Well, since I got NOTHING for the holidays, it wouldn't matter if it lasted all winter or all year! But I like your thinking. 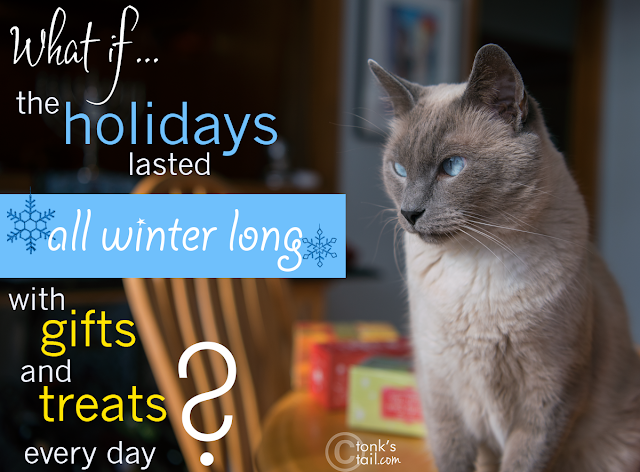 catnip mice and treats all winter. that would be lovely. Where do we sign up to lobby for this great idea, Maxwell! We would get bored with them. Wouldn’t that be great, Maxwell??? That would be good, wouldn't it, Maxwell. Yes, I could deal with that quite easily!